Join our welcoming Art Community and experience a Painting Class with Blu Moon Art Studio. I specialize in offering patient, thorough and highly valuable acrylic painting classes. Classes normally take place at the Sam Adam’s Brewhouse venue (Joshua Tree Room or Leader’s Bar), in the evenings. PLEASE wear appropriate clothes and shoes for painting or crafting. Seating can be arranged if noted on your ticket purchasing form. Suggested age is 9 or older to paint alone. Anyone 12 or younger must have a parent stay for the class. 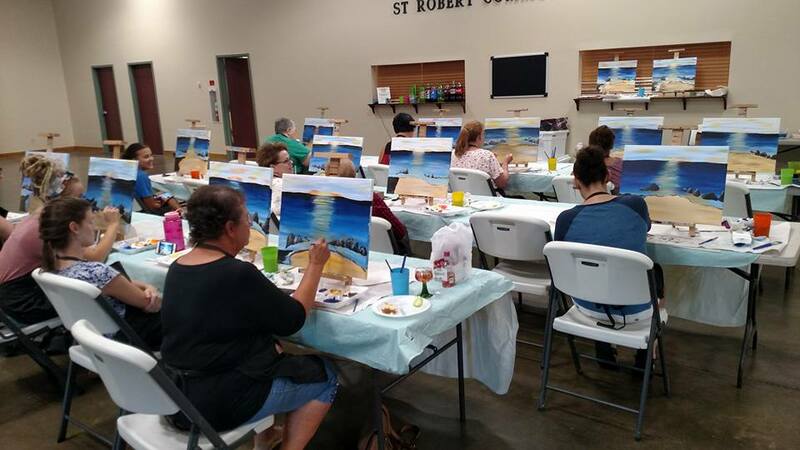 Looking for painting classes kids can go to? Check out the Kid’s Classes we offer through SKIES! Have you always wanted to learn how to decorate a cake so it actually looks nice!? Classes take place at the Sam Adams Brewhouse venue (Joshua Tree Room or Leader’s Bar), in the evenings. I will provide boxes and plastic wrap for you to take your cake home, if you want to keep it! Suggested age is 13 or older to cake decorate alone. With the purchase of a full price ticket, one child 12 or younger can be with you at your station, at no extra cost. If the extra person at your station is 13 or older, they will need to have a Helper Ticket, which does not include extra materials. “Helper Tickets” can only be purchased to go along with a full price ticket, with ONE maximum helper ticket per full price ticket. Get a “Helper Ticket” for $20 HERE.